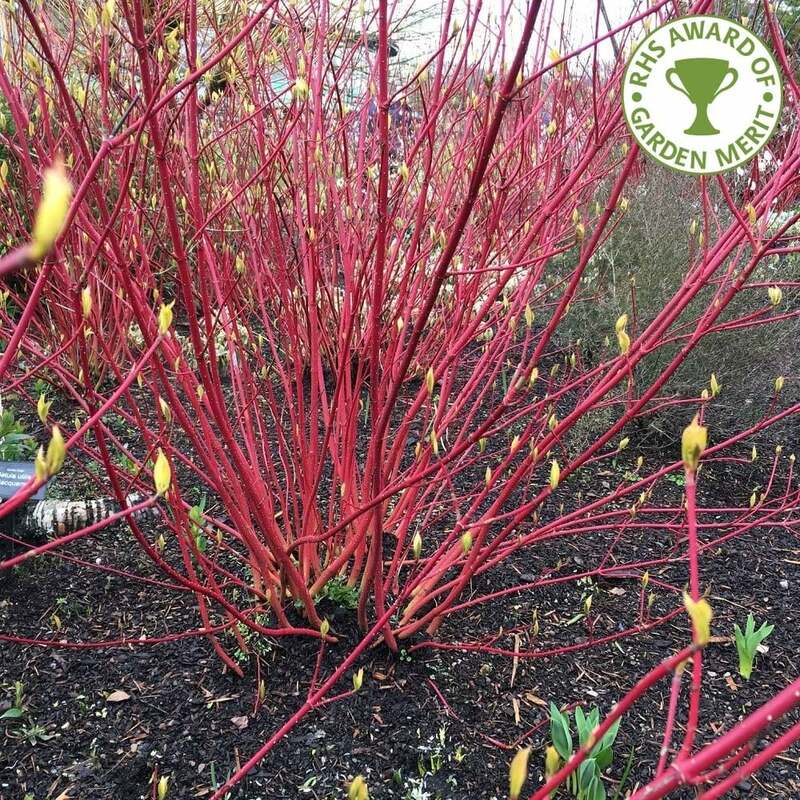 Cornus alba 'Sibirica' is a very hardy deciduous shrub that really come into its own in autumn and winter when the crimson red stems are bound to add drama to any garden. Flowers are small and cream, producing bluish-white berries in autumn. The oval green leaves turn reddish in autumn, before dropping off. This gives way to the bright red stems that make ‘Sibirica’ such a popular shrub. 'Sibirica' will grow in most soil conditions, preferring well-drained soil. They are relatively fast growing and while best in full sun, they are content in partial shade. Dogwoods look great either individually or as a group for adding colour to winter borders. We also offer other Dogwood shrubs with different coloured stems. Pot grown Siberian Dogwood shrubs can be planted at any time of the year. Firstly, remove all weeds and grass within a metre of your desired planting hole. Dig a square hole as deep as your root mass and approximately 1.5x as wide. To help your shrub establish more effectively we advise sprinkling root grow in the hole, especially if you have poor soil. Gently loosen the roots and place into the planting hole. Using 50% of the original soil and 50% compost, fill in the hole and firm around gently. Make sure not to bank the soil up around the collar of the plant. The help and advice has more detailed information and videos. If you’re planting in spring or summer, water well and regularly for the first few months. If you’re planting in autumn, you may only need to water the shrub a little. Make sure to keep an eye on the young shrub and increase watering if there are extended periods of hot or dry weather. Make sure not to over water as, whilst they tolerate damp soil, Dogwoods do not like wet soil. Do not prune Siberian Dogwood shrubs in the first year. Each subsequent year we recommend pruning hard around February. If you leave the pruning to the end of February or even early March, you will benefit from enjoying the colourful stem for a little longer without any detrimental effect on spring growth. Follow pruning by mulching and fertilising to encourage new growth, as it is this new growth that displays the vivid colours.